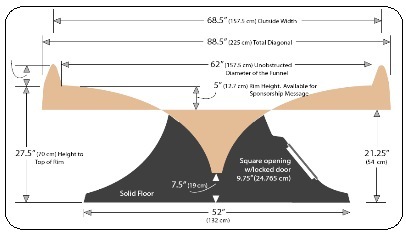 As you review these dimensions further down this page, keep in mind that our proprietary design with the ramps mounted OUTSIDE the circumference allows the coins to roll on the ENTIRE surface of the funnel without having to be launched on a reduced path that misses the ramp on the opposite side. This INCREASES the effective diameter as much as 12 inches on each side, and produces lots more coin-spinning revolutions for a bigger show. It allows us to keep a relatively small foot-print which stores, restaurants, and other retail locations really like, but with more spirals than past models...a great combination. To help illustrate the significant benefits of this new innovation, notice the "effective diameter" and coin-rolling time of an old 5' diameter Well in this video. Now compare that with our new 3' Well in the next video. You will notice in the old 5' model that the ramps are mounted "inside" the funnel and the effective rolling surface is no larger than the new 3' model which is less than half the overall size and cost...both very important factors. You will notice on the new 3' model that the coins use the entire surface with the first revolutions all the way around the perimeter. The coins actually roll longer in the new 3' than in the old 5'. Said another way, the new patented design of the Three-Footers puts on the same coin-spinning show of the old Five-Footers, at a much lower cost and floor space. 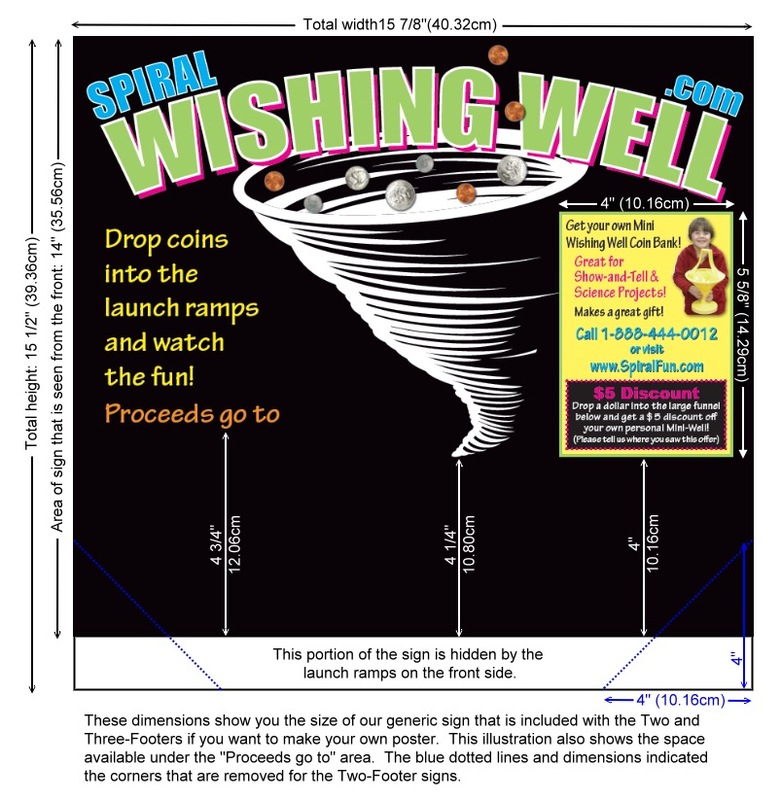 Of course, our Seven-Footers are even more spectacular and include EIGHT COIN LAUNCH RAMPS mounted outside the funnel! But you have to have a fairly large amount of floor space and foot traffic for it...primarily designed for shopping malls, airports, stadiums, museums, zoos, planetariums, etc. Click here to compare our new Wells with older models. Also, because the ramp-mounting surfaces are toward the back of the Two and Three-Footers, and in the "corners" of the Seven-Footers, they do not increase the side-to-side width of the Well. Said another way, when we place the funnels into a box, the ramp-mounting surfaces occupy the otherwise unused "corners" which means they do not increase the foot print floor size, or the shipping cost. We refer to our models based on their measurement across the top of the funnel, including the ramps. The Three-Footer is the maximum size allowed by Fedex and UPS without incurring large oversized fees. Seven-Footers are shipped by truck freight, or internationally through consolidated air freight unless you are ordering multiple quantities. We have Seven-Footers all over the world...including China, Latvia, Norway, Costa Rica, Russia and many other countries. The details in this table are about the Two and Three Footers. Seven Footer dimensions are at the bottom of this page. Three-Footers are the largest allowable shipping size with Fedex and UPS without incurring huge oversized fees. Coin Slot: The slot in the Two and Three-Footer coin ramps accommodates a coin up to 1.700 inches (4.318cm) in diameter by .115 inches (.2921cm) thick. We have not heard of any common coins in any global currency that do not fit through that opening. Of course, some coins are multi-sided, and they don't roll as well since they tend to “bounce” from edge to edge, but they still perform an enticing show. Seven-Footer coin slots are "open-top" so the size is unlimited. You can even drop balls down the chutes. There is more about coins, sizes, edges, and the physics of coins and balls in our Student Guide. Two and Three-Footer sign frames are 15 1/2" (39.36cm) tall and 16" (40.64cm) wide. They are made out of P.E.T.G. plastic which is folded in half to create a "sandwich" into which the poster sign is placed. We supply a generic sign, but you can make your own if you prefer. 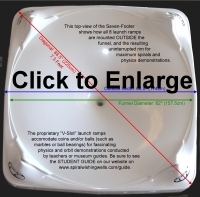 Click here to see exact sign dimensions. The Two-Footer weighs 24 pounds (10.89kg) and the Three-Footer weighs 33 pounds (14.97kg). So these two sizes are relatively light and easy to handle. When fully assembled, they will fit into a mini-van or SUV laying on their side, or standing up with the sign removed (two screws). You can even transport a Three-Footer in a small car, but you would need to separate the funnel from the base (th ree screws). Some customers want to be able to move their Wells in and out of a locked area and wonder if wheels can be added. We do not recommend wheels for a variety of reasons. Fortunately, there is a better alternative. First, the reasons why we don’t recommend it. Adding wheels raises the height of the Well making it more difficult for children to see down into the vortex as the coins descend. If they can’t see down into the funnel, they will try to climb on it which creates a hazard. We always tell people that there are two things we have no control over…the size of coins, and the size of children! 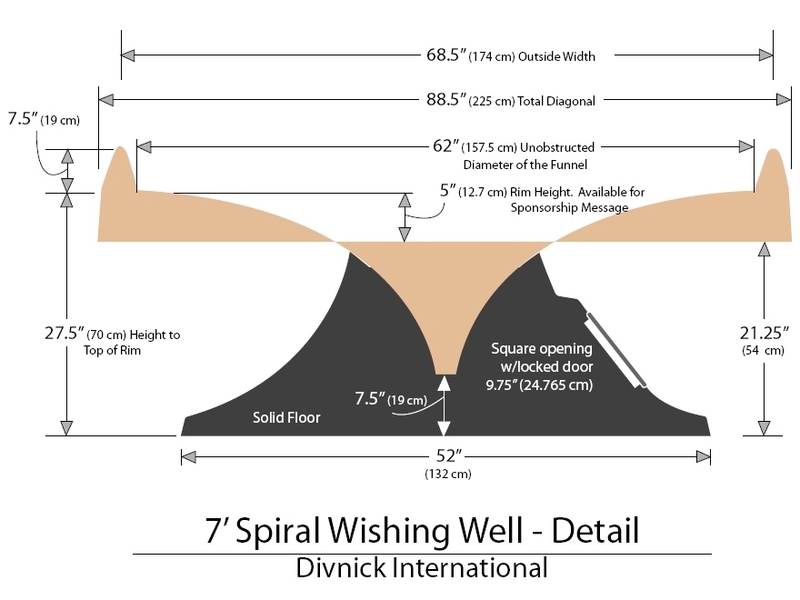 So the height of the Well is a very important aspect built into its design. By their very nature, wheels are not stable. Even with 4 lockable wheels, it’s only resistance to sliding would be on the fractional bottom of 4 slippery wheels. For those reasons (safety and height) we do not offer Wells with wheels. To be sure, some of our customers have added wheels, and just as many have reported that they later removed them. 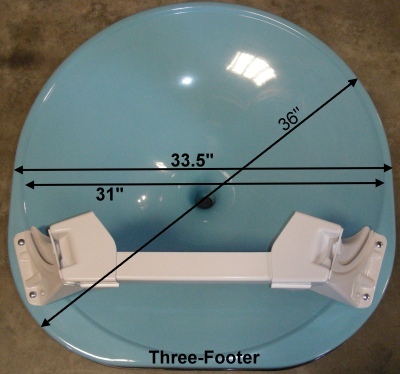 Two and Three-Footers are easily lifted (when empty of coins) or dragged across the floor. 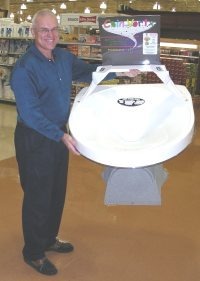 The base is soft-plastic so it won’t harm your floor. Seven-Footers weigh about 150 pounds when empty of coins, and can be lifted and carried with two modestly strong people. Many of our customers move their Seven-Footers every day from a secure room into the main walkway with 2 people who lift it onto a 4-wheeled flat dolly, roll it out, then lift it off. Some have tried wheels on the bottom, but quickly learned the disadvantages. They now say it is faster to lift the Well on and off a dolly than it was to lock the wheels, and their Well is stable and safe on its own base. The following image shows the line-drawing detail of the various dimensions of the Seven-Footer. Click here for a large PDF version of this drawing. Click here for a large .jpg version of this drawing. There is no limit on the size of coins that can be launched in the Seven-Footer because it uses an "open-top slot". Weight: Seven-Footers weigh 150 pounds (68 kgs). When empty, two people can lift and move them. Yet, they are very stable even when leaned on. The actual shipping weight is 250 pounds (113kgs) which includes the pallet and crating. The billed shipping weight is based on the size of the package...referred to as "dimensional weight." That is why we can fit additional 3-Footers and toys into the open spaces of the packaging at no additional shipping cost. Click here for more photos, details, and Seven Footer prices. Seven-Footer signs can be any shape you wish. You are not limted to the arc of the fiberglass rod. You can make signs in the shape of animals or any other shape that you wish. However, if you want to use our standard arc shape, click here to view a PDF of the exact sign dimensions.